With July’s product updates, we're continuing to meet the changes constantly coming down the pike of the fast-paced contract and document management world with a smarter, sleeker, more streamlined user experience. If you've found yourself clicking around for a minute looking for a specific account setting, or having to write down where a particular menu resides so you can get there the next time around, search no longer. The Account Preferences menu has been renamed Account Settings, and along with the new name, we've architected sub-menus along the most intuitive lines possible. Looking for your Doc Launcher, Workflows or Forms? You'll find those under the Automation Tools menu – because that's what they are (and you can see the full list of sub-menus coming your way here). With these new menu hierarchies, you'll spend no time looking for the tools you need – and more time using them. Tens or hundreds of individual job responsibilities working in tandem are what make a contract management process go 'round. And being able to keep all of those tasks straight throughout an enterprise is what makes for a successful operation. That's where our task management tool really shines. 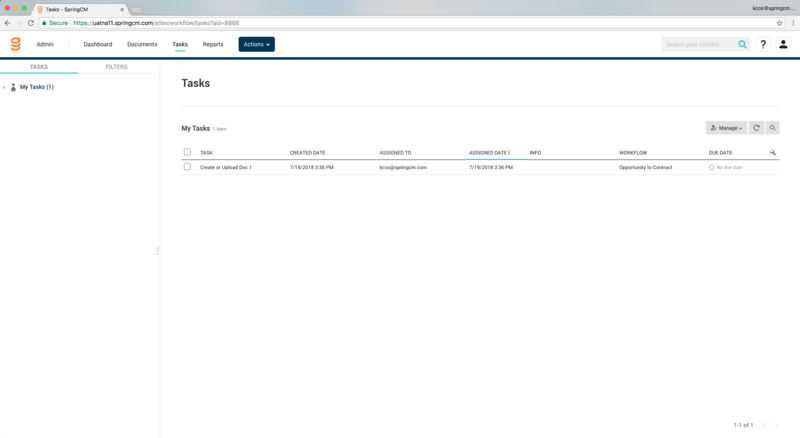 It's replacing our old Workflow Inbox in all SpringCM accounts and will help you think of all the steps everyone takes throughout the contract management process as part of one big, seamless picture. And it has all sorts of dynamic filters and other features you can use to sort workflows in a way that works best for you. If you haven't seen it yet, check out this article and video for a preview! 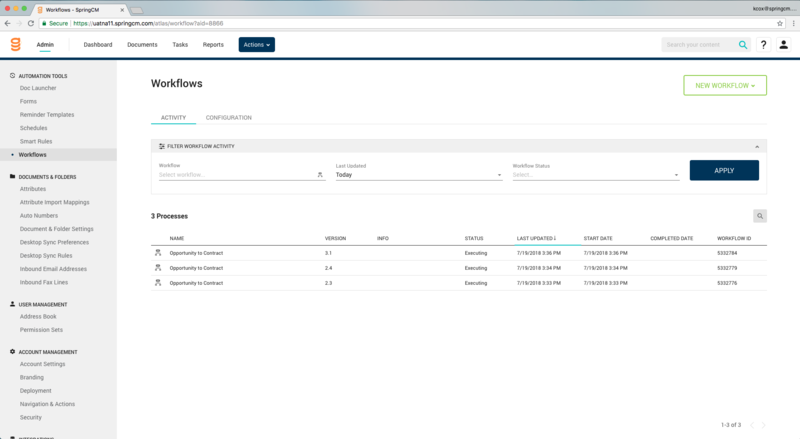 And don't worry if you're an administrator and are wondering what happened to the functionality of the Workflow Inbox – we've got something better in place. Grouping similar things together make for a more intuitive user experience, so we've put all of our workflow-related administrative tools together on a single Workflows page. Creation, administration and monitoring will all happen from here, so you'll know right where to look when you need to focus on workflow-related tasks and metrics. Beta-testing users are loving our updates to Doc Launcher, which makes it more convenient to use. We’re introducing a new interface that lets you see all of your templates at once, and makes filtering through templates even easier. The data has been telling us that having your custom actions scattered throughout the menu isn't quite as efficient as having them all in one place. So we're moving all of those custom actions into a global Actions menu (over the next couple of months). 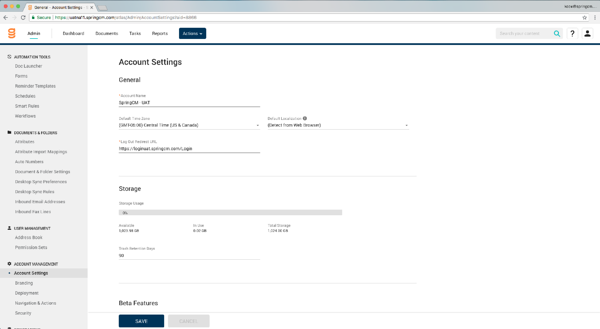 And if you administrators have lost track of which actions are customized and which aren’t, we're giving you a Legacy Custom Actions report to help you migrate them to the central location. Retiring legacy versions of the SOAP API. Consult the full release notes for more information on these important changes, which could impact usability. The upgrades we're making to SpringCM are, as always, driven by the real-life needs of our users. We see and hear how you're using the platform, what's working for you and what could work better, and continue to improve based on that – to make once-labor intensive tasks like contract routing and signing processes you barely have to think about. A streamlined contract management process is a bedrock of a streamlined office, and we never stop making sure that our tool itself is as streamlined as the processes you're using it to automate. So enjoy the new features and check out the full release notes to see the bugs we've squashed, the fixes we're working on and even more betas and features that will soon be on the way -- throughout the summer and well after things start to cool down outside! At least once a week, we publish blog posts like this one. Subscribe below to stay in-the-know.